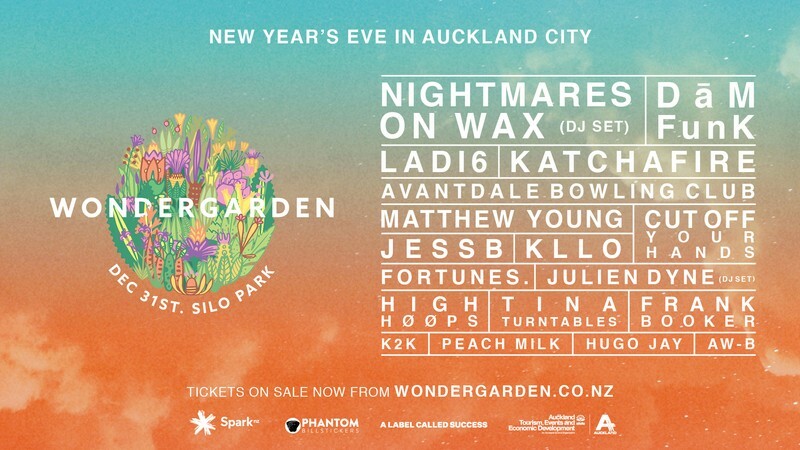 Welcome to Wondergarden, Auckland’s New Year’s Eve festival musical extravaganza! Wondergarden has pulled out the stops to see you into 2019 right, and provide the ultimate soundtrack to Auckland City’s favourite NYE party. With the inclusion of some incendiary local talent to an already stacked bill, and the addition of a new silo DJ zone, Wondergarden have got your staycation sorted. More bars; Auckland’s finest food trucks; the ultimate view of the Sky Tower’s midnight fireworks display; and an explosive 18-strong lineup of world class musical mayhem; it’s all for you! Situated at the city’s favourite waterfront location, Silo Park. And thanks to Wondergarden, Spark and ATEED, there is a monstrous giveaway prize pack for an Auckland NYE holiday, to coincide with the lineup release. It Includes return flights, two night’s accommodation, a Huawei smartphone, Spotify headphones, Munro Wonderpants & Wondersocks, $500 entertainment vouchers at Wondergarden, tickets to Spookers, tickets to Waiheke island on Fuller’s 360 ferries, and much more!